Sausage is the new burger, only better. It’s a big claim being made by new East London foodie joint X-Upper, but after taking a little trip to their funky restaurant, we might be jumping on the bandwagon. Specialising in juicy, gourmet sausages that have been coal grilled and served with complementing sides and sauces, X-Upper wants to make one of the worlds most popular street foods an everyday delight. The multicultural menu sources delicacies from some of the world’s proudest sausage-making nations, from Spain to Switzerland and even locally in the UK. An ever-changing Season Specials section puts the spotlight on more creative flavours, giving you both the choice of a well-loved classic or a modern favourite. Kristen went for the Swiss OLMA, described as ‘the famous Swiss bratwurst’. Meaty and soft, this sausage was bursting with flavour and served with purple mustard sauce and pickled red cabbage. A portion of their potato salad was also on the plate, made using white wine vinegar, red onion, chives and Dijon mustard, as well as a hefty chunk of milk and honey sourdough, wonderfully light and soft. Mel, ever the cheese fanatic, went for one of the seasonal options, The KK (Käsekrainer). A decadent sausage from Vienna, Austria, it was filled with chunks of beef and pork and stuffed with gooey Emmental cheese that melted inside as it was grilled. 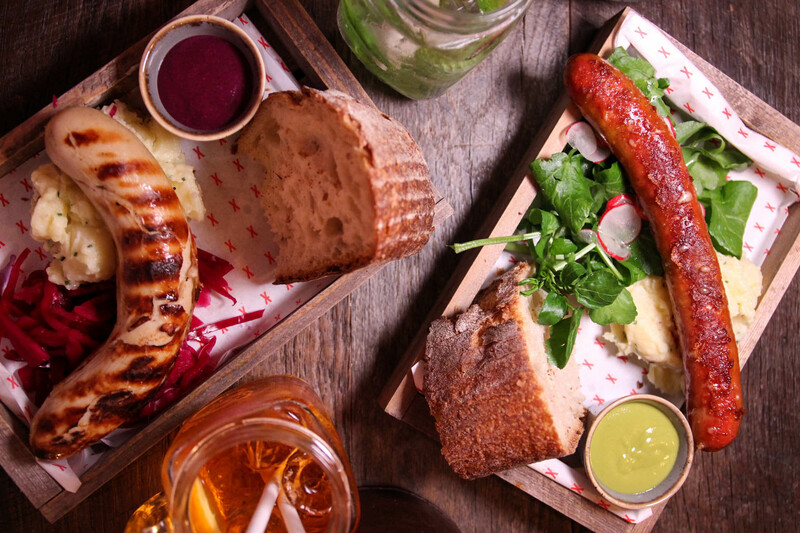 Served with a refreshing watercress salad to balance the richness of the sausage, X-Upper’s signature green mustard sauce and milk and honey sourdough bread, it was a decadent treat. Don’t be fooled into thinking one sausage won’t fill you up, because we definitely left feeling satisfied and stuffed to the brim. However if you’d like to add on any extras, X Tapas offers nibbles like olives, chorizo and saucisson, while other salad sides offer some freshness. The Sweet Passion will round the whole experience off and satisfy any sweet tooth; a light créme dessert with zesty passionfruit gel. X-Upper offer takeaway for those on the go, however dining in at their Angel-based restaurant is a real treat. The decor is worthy of any Instagram feed, with vibrant neon lighting and a very chic mural of Kate Moss, and the staff are super friendly, chatty and are willing to laugh at any oh-so-original sausage jokes you throw their way. Located on the bustling Upper Street in Islington, it’s definitely worth checking out next time you’re looking for some informal dining.